Margaret Wehrenberg, Psy.D., a licensed clinical psychologist, is the author of numerous books on the treatment of anxiety and depression, including You Can Handle It: 10 Steps to Shift Stress from Problem to Possibility (PESI, 2017) and The 10 Best Anxiety Busters (W. W. Norton, 2015). An expert on the treatment of anxiety and depression, she also has extensive training and expertise in the neurobiology of psychological disorders. She earned her M.A. specializing in psychodrama and play therapy with children. Dr. Wehrenberg has years of experience as a drug and alcoholism counselor, working with the U.S. Army in Germany and Lutheran Social Services in Illinois. She also has training in trauma treatment, EMDR and Thought Field Therapy. 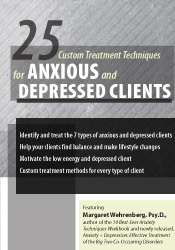 She has a private psychotherapy practice in Naperville, IL , specializing in treating anxiety. In addition to clinical work, she coaches business professionals on managing anxiety, she frequently contributes articles for The Psychotherapy Networker magazine, and she has produced Relaxation for Tension and Worry, a CD for breathing, muscle relaxation and imagery to use with anxious clients. Her book The 10 Best-Ever Anxiety Management Techniques, 2nd Edition (W. W. Norton, 2018), is a consistent top seller for anxiety management.